For this treatment, blankets are soaked for hours in herbs rich in healing the body. The blankets are placed in an alpha capsule and you are cocooned in the herbal blankets for 30 minutes. The herbs have a detoxing effect on the body which provides healing for aching and tense muscles. This wrap provides a youthful glow to the skin. A mixture of powerful seaweed, vitamins, minerals, and antioxidants is applied to the skin and then a wrap is applied. You will be placed in the environmental capsule for 30 minutes which has infrared heat, aromatherapy, vibration, and steam. A rush of oxygen to the tissue leaves the skin firmed, hydrated, and revitalized. Want to drop 6-20 inches from your neck to your ankle? That is exactly what this treatment will do. We use nutrient infused clay from the Dead Sea that pulls toxins out of your fat cells. Then, we use the Egyptian art of pressure wrapping to tighten and cleanse the body. Finally, you will go into our Alpha Capsule where aromatherapy, infrared heat, vibration, and ionized air will give you a relaxing and rejuvenating experience. Parafango is an exclusive blend of mud from the ancient sea beds of Southern Europe. This area is rich in organic minerals, plus pure paraffin wax provides an effective, luxurious body treatment. Warmed, it glides onto the skin sealing in the nutrients that temporarily increase circulation. This treatment firms and tightens affected areas by encouraging circulation, reducing excess fluids, activating lymph for detoxification, and soothing cellulite. The highly sophisticated botanicals, electrolytes and creams are tailored specifically for cellulite, detoxification, and contouring of the body. We all have over 3,000 lymph glands which hold toxins from the body. Unfortunately they have no pump to remove the toxins to the excretory system. The myo-pulse has the technology in the field of electro-stimulation to help produce a healthy lymphatic system. The myo-pulse is soothing, relaxing, and a safe experience. The liver and kidneys are the filtering plants of our body. To cleanse these organs which are so important to health we once again use the Myo-pulse technology and botanical creams which are tailored specifically for organ detox. This state of the art computer reads the tissue and interprets the bio-impedance and responds with precise levels for maximum cellular cleansing. This treatment is soothing, relaxing, and safe. A favorite among customers. We use the Le Fleur equipment which energizes the cells by reading them and feeding back needed energy. Clients have reported that their friends thought they had surgical work done. This treatment does wonders! The phototherapy comes in two forms, red and blue. Red is used to stimulate collagen and elasticity reducing facial lines. The blue is used to fight bacteria reducing the frequency of breakouts. This treatment will rid your pores of dead skin cells, dirt and debris. Benefits also include cellular renewal, toning muscles and an increase in blood circulation. This classic facial is customized specifically for your skin care needs. You will experience a deep cleansing with exfoliation and relaxing steam mist. It includes a pampering facial massage and tailored mask to rejuvenate and illuminate your complexion. This is a no fuss facial formulated specifically for men. To start , a relaxing deep pore cleansing and exfoliation with steam. A facial and neck massage to follow and ending with an individualized face mask. The skin you want is under the skin you see. Reveal it with our powerful, non-surgical acid-hybrid peel. You’ll undo years of visible damage and premature age signs – without redness, flaking, or actual “peeling” of the skin from a traditional peel. Our advanced peel technology removes the uppermost layers of the skin at the microscopic level, to immediately tighten, unclog pores, improve lines and leave skin with a younger, velvety-smooth texture. Plus, you’ll benefit from detoxifying activated charcoal to draw out aging impurities. Best results achieved with a series of treatments – your Esthetician will choose from two different glycolic acid levels to meet your skin’s need each time. Are your hands prematurely aging you? Our powerful, non-surgical chemical peel will remove the uppermost layers of aging skin on the hands and chest, and reverse years of aging damage. You’ll see smoother, brighter, younger-looking skin – with ZERO pain, flaking, or downtime. Your skin’s introduction to our Glycolic Detox starts here with this series. Your Esthetician will choose from two different glycolic acid levels to meet your skin’s needs. Progressively increasing the strength. This treatment includes a relaxing steam mist, enzyme treatment and is followed with a calming mask. This therapeutic massage utilizes reflexology: application of pressure and massage to specific areas of the feet or hands correlating to specific parts of the body. This massage also includes your choice of aromatic essential oils which are added into the massage oil. The cranial sacral system works with the natural healing mechanisms in the body to help it return to an optimal state of health by reducing stress and muscle strain. This treatment originated with the Ancient Romans. A vacuum is created facilitating the removal of ear wax, bacteria, moisture, and allergens from the ear canal. Two candles are used in each ear. Massaging is done to facilitate the removal of the ear wax. This treatment does not burn or hurt. The stones are heated and used to massage the body providing a deep sense of peaceful relaxation and the heat relaxes the muscles. This relieves chronic pain and reduces stress. Learn to give your baby a beneficial soothing massage. This is an ideal way to spend an enjoyable-relaxing time with your little one. A highly specialized gentle stretching technique used to equalize muscle tension combined with a therapeutic massage. This targets the myofascial trigger point. This can be a standalone full body treatment. A prenatal massage is designed to relieve the discomfort that is prevalent during pregnancy. A must have relaxation experience for pregnant women! Reiki is used to relieve pain, reduce stress, strengthen the immune system, rebalance organ function, and eliminate harmful toxins. Besides all these benefits, it also restores the body’s own healing mechanisms. A great treatment for dry skin, salt scrubbing gets rid of dead skin cells. Besides being healthy, this treatment is also very enjoyable, removes toxins, extra soft and relaxes the body. A must have treatment for athletes! It comes with a pre and post sport appointment to maximize performance and range of motion. This technique uses effleurage (gliding), petrissage (kneading), friction, tapotement (rhythmic chopping), and vibrational strokes in a purposed order. This full body massage is designed to soothe and relax. This treatment utilizes the combination of modalities of the massage to target a clients’ individual needs while promoting full body relaxation. This is a customized massage just for you. Escape into relaxation and melt your worries away! Perfect for someone who would like a soothing and relaxing massage that melts away tight muscles while providing a deep sense of well-being. Discover what you’ve been missing with this heated massage. Soft cold laser acupuncture has been practiced widely in Europe and Asia. The USA is catching up. The number one reason for visits to healthcare provider is pain. Laser is an excellent way to reduce pain and release muscles without needles. Laser acupuncture has been in existence since 1951. Our spa combines Laser Acupuncture and the Alpha Capsule to give you the best treatment to quit smoking. This program has a 95% success rate when you are psychologically ready to quit. The capsule removes the nicotine out of the pores of the skin and the laser removes the addictive qualities of smoking. This treatment never ceases to amaze our staff because it is so effective. Laser Acupuncture for weight loss is a 3 treatment program with 5 to 7 days between treatments. This is great at curbing your appetite and reducing cravings. The laser has absolutely no pain and no side effects. We use it for weight loss, but it is also great for pain. The Alpha Capsule increases your metabolic rate and burns calories during and after treatments. You will feel and look wonderful. Standard Process has a great 21-day detox program which also promotes weight loss. 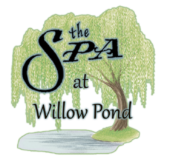 The Spa at Willow Pond’s owner and founder’s favorite is Ideal Protein: she lost 89lbs in 5 months! The program works by allowing the pancreas to rest and heal. It is based on eating highly absorbable protein and low carbs. This way of eating is definitely a no brainer and you feel so healthy on the program.